Promoting your brand, especially when it relates to consumer goods can get a huge boost from printed media. In-store displays must attract the attention of customers, product packaging needs to communicate the advantage your product offers over the next product on the shelf, and even before a product hits the store shelves, manufacturers need to motivate retailers to give valuable shelf space to their product. In each case, printed materials contribute significantly to the perception of the brand. Coordinating each element of your brand promotion can sometimes involve several different companies providing different print products, where ensuring that your brand guidelines and colours are consistently applied, can add time and frustration to the process. 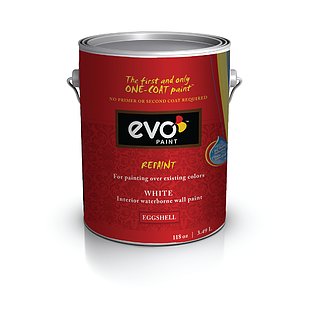 Evo Paints was in the process of introducing a new product called EVOpaint ONE-COAT. They called on MLB Print Management to help them manage a variety of printing needs as they prepared to launch the new product which distinguishes itself from other paint products in that it is the only true one-coat paint product on the market. In order to get the paint out to retail locations, EVOpaint needed to have a strong presence in front of the buyers that attend shows like the National Hardware Show. MLB Print worked with EVO to create an attractive and informative trade show presence that featured live demonstrations of the technology. The brand was communicated throughout the display area which featured retractable banners, printed brochures, product sheets, and of course business cards. In a highly competitive market with several well known brands, EvoPaint needed to ensure that their products would be presented to consumers effectively. Once again, Mick at MLB Print was able to work with EvoPaint through the design, testing and production of Point of Purchase displays for retail locations including fan-deck paint swatches that help to communicate the advantages of EvoPaint’s ONE-COAT technology. 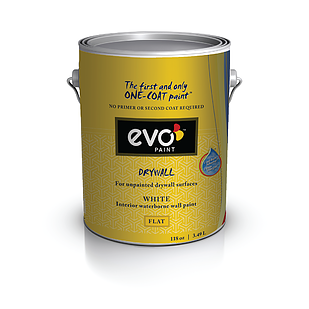 In addition to the Point of Purchase marketing tools, EvoPaint also needed professionally produced labels for their paint products. MLB Print Management was able to design and produce labels that compliment the in store product positioning and that would reflect the high quality of the product. Through one call to MLB Print Management, some very successful industry tradeshows, and determination EvoPaint secured distribution to over 750 Timbermart stores and interest from several other retailers.